A mass crash pile-up involving more than 25 vehicles on the Interstate 84 in eastern Oregon on Saturday fortunately did not cause any fatalities for the 100 people involved. Miraculously even Kaleb Whitby survived after being pinned between two semis in his crumpled Chevy pick-up truck. Oregon state police say that black ice, steep terrain and poor visibility are blamed for causing the series of crashes on the I-84 near Baker City and shutting down the main thoroughfare for most of the day. The pileup included more than a dozen semi-trucks and blocked dozens of vehicles from leaving. Many vehicles were still stuck at the crash site late into Saturday afternoon as authorities worked to clear the highway. "I think we're fortunate that there weren't any fatalities here," said Sgt. Kyle Hove, an Oregon State Police spokesman. 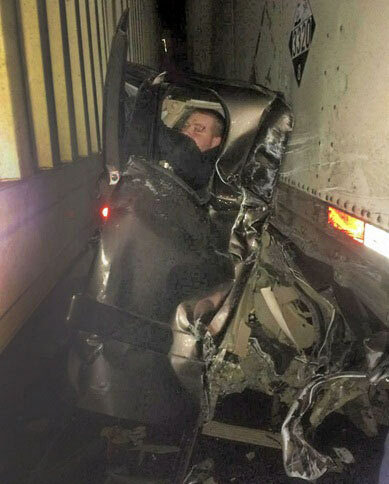 While 12 people suffered from various injuries and one person was in critical, but not life-threatening condition, everyone is mostly amazed as to how Kaleb Whitney managed to walk away with only cuts and bruises after being pinned between two semis. The semi had slammed into Whitby’s vehicle, causing it to crumple like a sardine can. One of the truck drivers came out to see if Whitby was ok and then took a picture of him wedged in the 3-foot wide area between both trucks. The photo has since gone viral and when Whitby saw it, he too marveled at the miracle of what he survived. “Something like that you don’t see twice in a lifetime. “Everybody talks about your life flashing before your eyes, it didn’t for me. All I could think about is my wife and my son and just hoping that it wasn’t my time and praying that I would be able to get through it,” Whitby said. Hazmat teams were also called to the crash site to determine if hazardous material had spilled and although one truck had been transporting hydrochloric acid, fortunately there were "no leaks in loads." Sgt. Hove credited the many “Good Samaritans” who had been involved in the crash but stepped out of their vehicles to help the wounded and used flashlights to alert on-coming drivers to slow down. "They saved lives," Hove said.